ANSE-LA-RAYE, St. Lucia, Dec 2 2015 (IPS) - In the Caribbean, some women find themselves on the frontline with the battle to mitigate climate change. Meet Dr. Krystal Cox. She is one of three girls who all studied medicine and got medical degrees. Unlike her two siblings who stayed in the medical profession, Cox, 32, is working in a different field. She works on her father’s farm tackling a different kind of threat than sickness and disease. Having spent almost all of her life on the farm, Cox has seen first-hand the effects of climate change, something she describes as “a serious issue” which people don’t talk about enough and which requires more resources. “This year it was a very bad drought and there were lots of crops and no irrigation in the area where they were planted,” she explained. “There is a river that runs along the border of our property and I have never seen it so low and even that poses a problem because if it’s too low we are not allowed to pump out of it because of course people need it,” she said. “I was the one who was open-minded enough to go into farming and to get my hands dirty. I do everything that all my workers do plus manage the farm,” Cox told IPS. “When I first started, my dad made it very clear that he wanted me to have an understanding of what the workers go through, not just to be compassionate towards them but also to have an understanding of what the work entails,” she explained. “If a lady comes to me and said I can’t lift this box but I have to carry it to pack it, if I don’t have experience lifting that box then I will not understand why she can’t lift it. So it was important for me to have an understanding of every role,” she added. Cox, who grew up on the farm, said she will ultimately be the one running it when her father retires. For now though, she continues to gain experience for when that time comes. “I have planted, I’ve harvested potatoes and tomatoes, I’ve worked in the greenhouses, I drive my own tractor, I plough my own land, I drive my trucks, I do deliveries to the supermarkets that we serve,” she explained. Cox is encouraging more women and youths to get into farming, assuring that there is nothing wrong with it. “We can’t eat unless we farm and to not glorify it and to not put it in a position where it’s respected and the people who do it are respected then you are going to have a lot of short comings especially with finance,” she said. 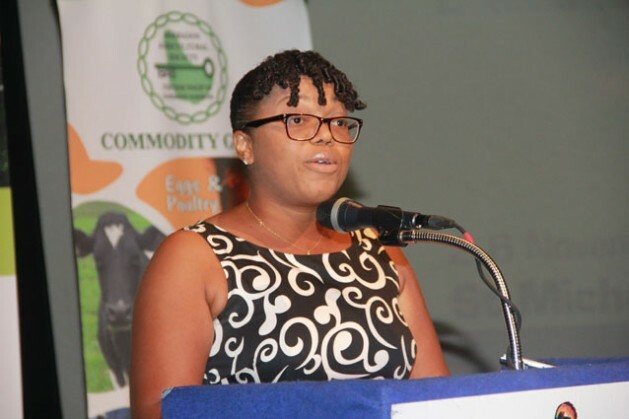 Pamela Thomas, who heads the Caribbean Farmers Network (CaFAN), said there are finances available to assist farmers but accessing these finances can prove challenging. “When a farmer who wants to get a loan goes to the bank or another financial institution, one, you can’t use your farm as security because you don’t have farming insurance. So that farmer may be asked to put up his or her property to guarantee a loan. Now that is high risk because it doesn’t only belong to the farmer but it belongs to the entire family,” she said. CaFAN represents farmers in all 15 Caribbean Community (CARICOM) Countries. Initiated by farmer organisations across the Caribbean in 2002, it is mandated to speak on behalf of its membership and to develop programmes and projects aimed at improving livelihoods and to collaborate with all stakeholders in the agriculture sector to the strategic advantage of its farmers. Thomas also said that the impacts of climate change increase a farmer’s expenditure but farmers have serious difficulties accessing financing. Thomas said many farmers do not keep proper records and this also poses a challenge to accessing finance. “Yes there are funding opportunities but these funding opportunities come with their complexities. You have to be able to write the project document, you have to be able to write the reports to be able to access this funding. So when it comes to filtering down to the average farmer on the field it’s not happening,” Thomas added. Jamaican entrepreneur and gender justice advocate Una May Gordon said the adverse impacts of climate change will particularly affect women but she noted that their unique knowledge and skill set concerning development and environmental management could greatly benefit adaptive efforts. “It’s not where it is supposed to be but I think the recognition of the role that women can play in adaptation both at the level of the community and implementing adaptation options is much more recognised,” she told IPS. “In the communities the women are probably head of households and therefore are more likely the most vulnerable of the lot when we have issues of climate change. They are the providers, they are the nurturers and therefore need to be treated as such,” she said. “In the fisheries sector in the region one of the little known fact is that the women fishers are more vulnerable. They are the boat owners so they are the investors, they own the equipment and the fishermen who go to sea people always believe that they are the vulnerable ones but if you have no boat, infrastructure or equipment then there would be no fisheries,” Gordon added. For many years, several international agencies have argued that the discourse on climate change does not pay adequate attention to women, either at the local project level or in international negotiations. They have argued that women are unable to voice their specific requirements even though the impact of climate change affects women and men differently.